Everyone knows that quality counts more than quantity... but sometimes it's nice to have both. Happily, that's exactly what IHOP is offering with their "All You Can Eat Pancakes" event, which runs till February 14 at participating IHOP restaurants nationwide. "All You Can Eat Pancakes" is a pancake lover's dream! 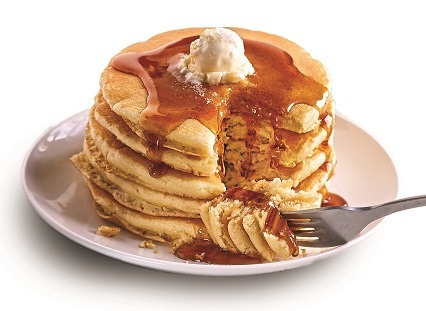 You can start with a plate of five pancakes for $5.99, or a breakfast combo with eggs, hash browns and breakfast meats like sausage, bacon, or ham plus a plate of four pancakes, starting at $8.99 (by the way, that's even cheaper than the regular breakfast combo -- without the unlimited pancakes!). Once you finish your plate of pancakes, just ask a server for more and they will fork over another plate of fluffy, buttermilk-y goodness! 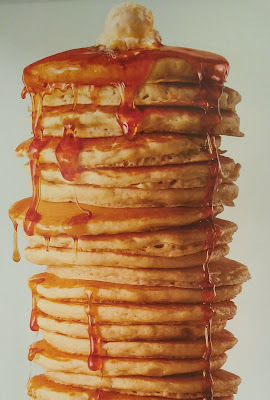 I like that they serve the pancakes two by two, so customers can truly order all they can eat, but there's less waste (plus you get to eat the pancakes while they're hot!). We've been taking advantage of IHOP's "All You Can Eat Pancakes" every year since we first heard about it. This year, they've introduced something new: for $1.99, you can order a small bowl of fruit toppings to go with your pancakes! You can choose from strawberry, blueberry, peach, or apple cinnamon. We tried all 4, and every one in the family has a different favorite, so we're pretty sure there's no way you can make a bad choice. We're not exactly delicate eaters, but we could only manage to finish 12 plates (24 pancakes) between the five of us. Then again, the boys aren't teenagers yet, so in future years I fully expect to see a lot more empty pancake plates stacked up on our table! 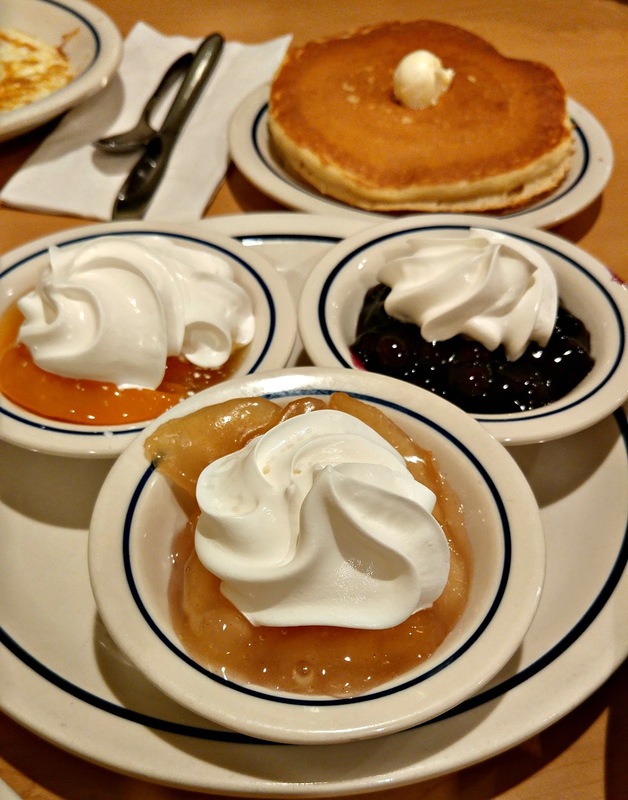 If you think you can polish off a few more pancakes than we did, IHOP is running a friendly competition called the Empty Plate Stack Challenge. Don't worry, you don't have to take the challenge up on your own -- take a group of friends to your local IHOP restaurant, see how many plates of All You Can Eat Pancakes you can conquer together, then upload a team photo of your empty plate stacks to Instagram. Tag them with #Panuary and #Entry along with your team name and number of pancakes eaten! Sounds good? Getting hungry? 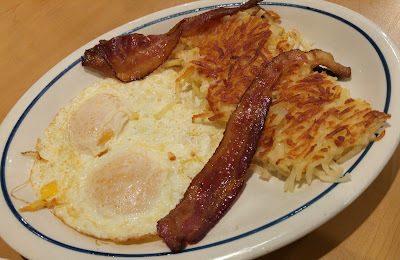 Go to IHOP and get ready, set, eat!! 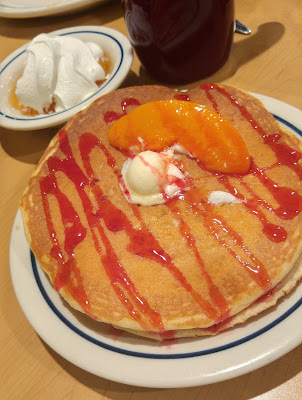 Disclosure: I received a gift card from IHOP which partially subsidized the cost of my family's recent visit to try out the All You Can Eat Pancakes promotion. The views and opinions expressed here are my own. A few days after the kids returned to school from their winter break, I packed up our holiday decor and got to work on ridding our living room of all the holiday mess. This is always the worst part of the post-holiday season; the loneliness and the mess is such a stark contrast to the hustle and bustle of last month. It's just now dawning on me that I have to find new storage/hiding spaces for all of the new stuff my kids received over the holidays!! I thought this year would be different, because we bought the boys an early Christmas present -- new bikes -- so they knew they wouldn't be opening big, bright presents on Christmas morning. At least, that was the plan. With the grandparents visiting, and all the stocking stuffers I capitulated on, plus the small presents that didn't cost much, but took up a lot of space, they ended up with tons of stuff anyway. In addition, they were born on December 30, so they received birthday presents as well! Dismantle some LEGO models that having been clogging up the top of their dresser. Clean up their storage space (last weekend we went through their old art supplies drawers and freed up a ton of space by throwing away old coloring books, markers, and crayons). Borrow more books from the library instead of buying them. If they want new toys, they have to get rid of some old ones (by donating or throwing away). If relatives ask them what they want for their birthdays, consider asking for the gift of "experiences" -- movie tickets, a cooking class -- or money towards their college savings account. Strategy number 6 is something we haven't yet done, but looks like it might be a good option: Pley. 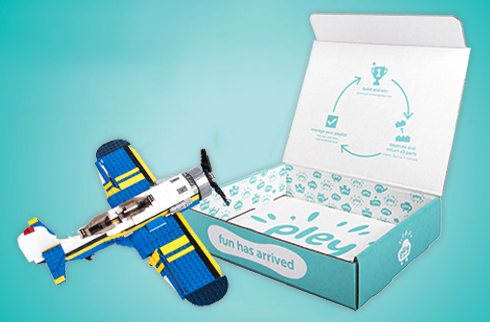 Pley is a toy rental service that lets members receive unlimited toys (one at a time) delivered directly to their door. 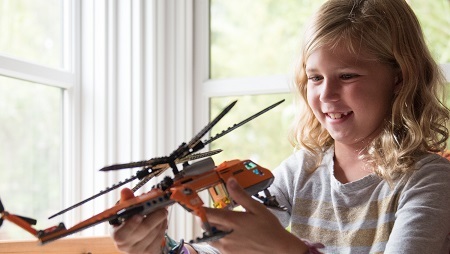 Pley gives subscribers access to a large selection of educative toys, including 400+ LEGO sets and popular robotics toys. Pley packages get delivered to your door and when the kids are done playing, they can return them for a new toy. Plans start as low as $19.99/month and all plans include free delivery and unlimited rentals. Kids always have access to the latest and greatest toys. Due to the variety, kids don't lose interest in the toys. Costs less than buying toys. Average savings for members is about $800 per year. Less clutter: you don't need to store as many toys, only the toys that the kids are currently obsessed with. No more toys sitting unused on shelves! Kids learn the concepts of sharing and reducing waste. One big reason holding me back is that my boys are tweens (age 12), and the toy selection (other than LEGO and robotics) may not be as wide for boys this age... but I've heard that Pley is expanding their toy range to include more robotics toys like drones! Did the amount of toys your children received over the holidays overwhelm you? What will you do about it in the new year? American Girl is making waves in the diabetes community with the release of their new diabetes care kit. The kit comes with the supplies needed to manage diabetes, including an insulin pump, insulin injection pen, glucose tablets, blood sugar monitor, food log, and more. What a great way to include girls with diabetes in creative play! They can now play with American Girl dolls that look just like them and go through the same things that they do. 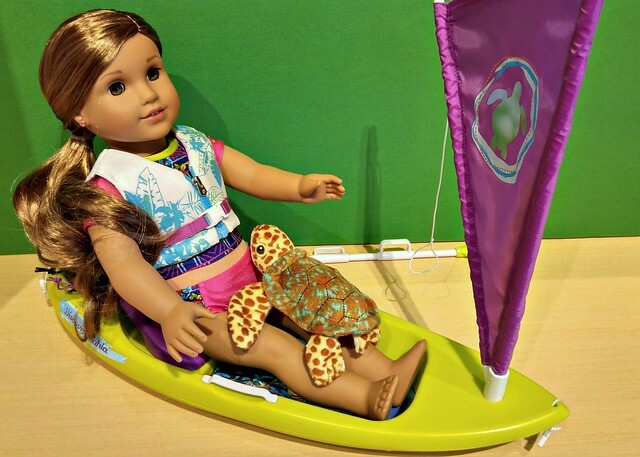 American Girl is not the first company to make toy accessories for kids with diabetes. 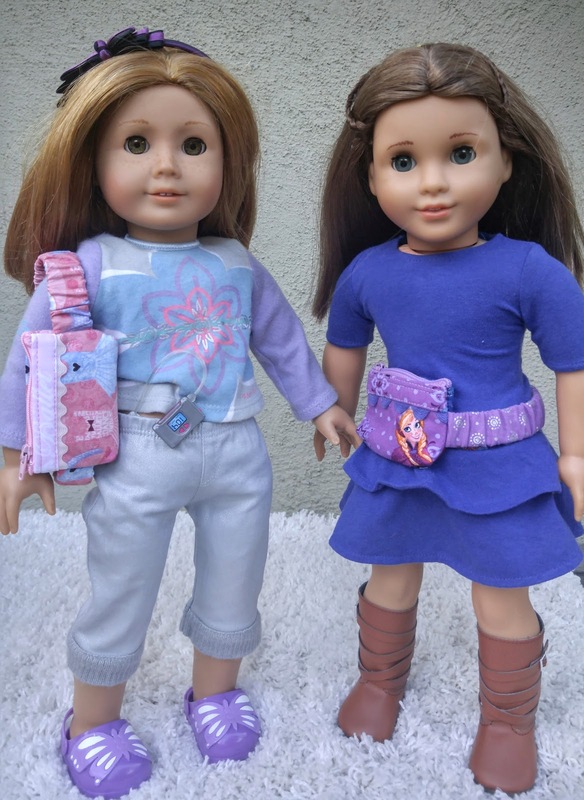 Too Sweet Boutique is a company that makes pouches that hold kids' insulin pumps, and they also make matching doll pouches. Too Sweet Boutique sent me samples of the doll pouches ($18), and they are adorable! 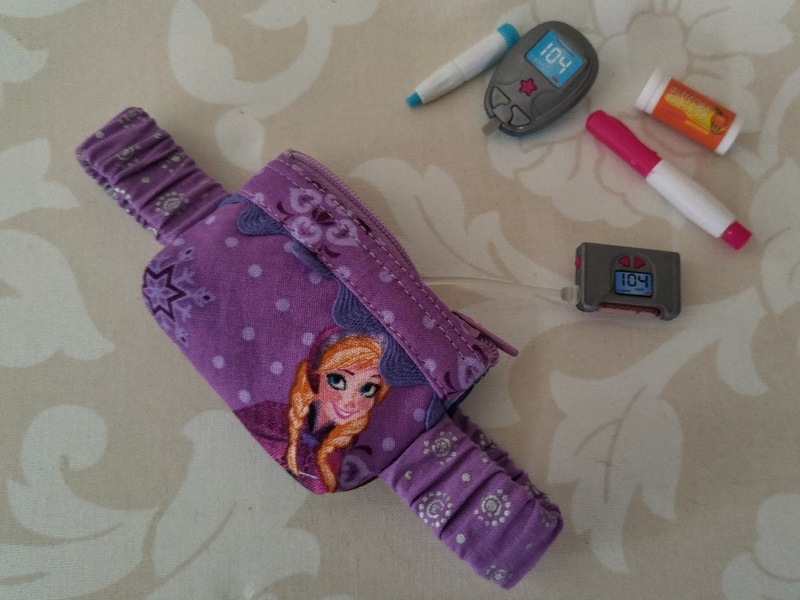 The doll pouch has a working zipper so kids can put in their doll's diabetes supplies (note: the supplies in the photo above are from American Girl's diabetes care kit, they are not included with the pouch). 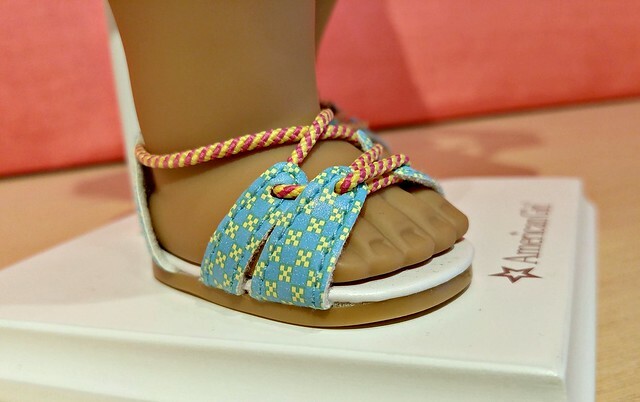 It has an elastic belt that easily slips around the American Girl doll's waist. They come in a variety of cute prints, as well as solid colors. 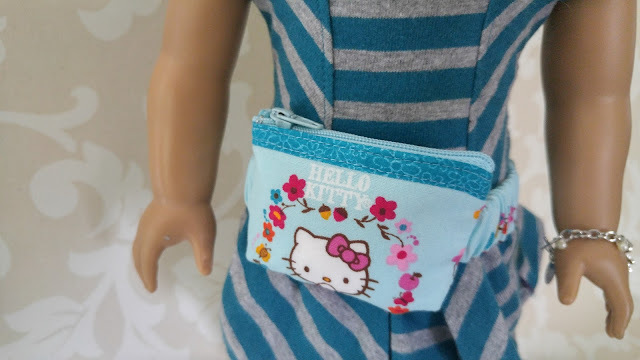 These pouches can be ordered along with the child-sized diabetes pump pouch in matching colors, so the girl can match with her American Girl doll. By the way, the pouch isn't limited to holding diabetes supplies -- it looks just like a regular fanny pack. It can hold a toy doll phone, notebook, camera, water bottle, snack, or other toy accessory for American Girl doll. 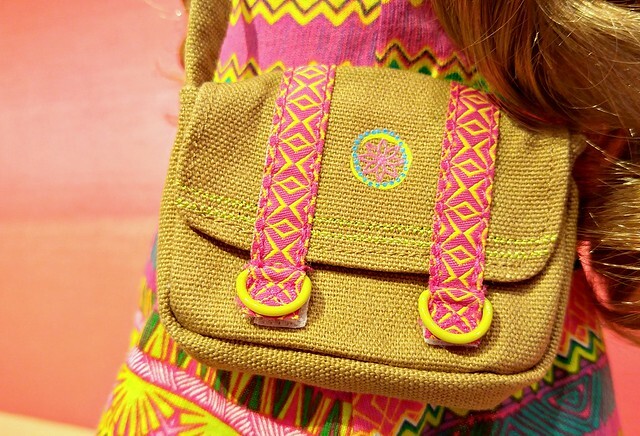 I personally think that these make adorable on-the-go packs for any American Girl doll! Many of the prints on Too Sweet Boutique's website are "boyish" prints, with cars, trucks, Star Wars characters, and more, so even girls who don't like "girly" prints as well as boys can order these toy pouches! 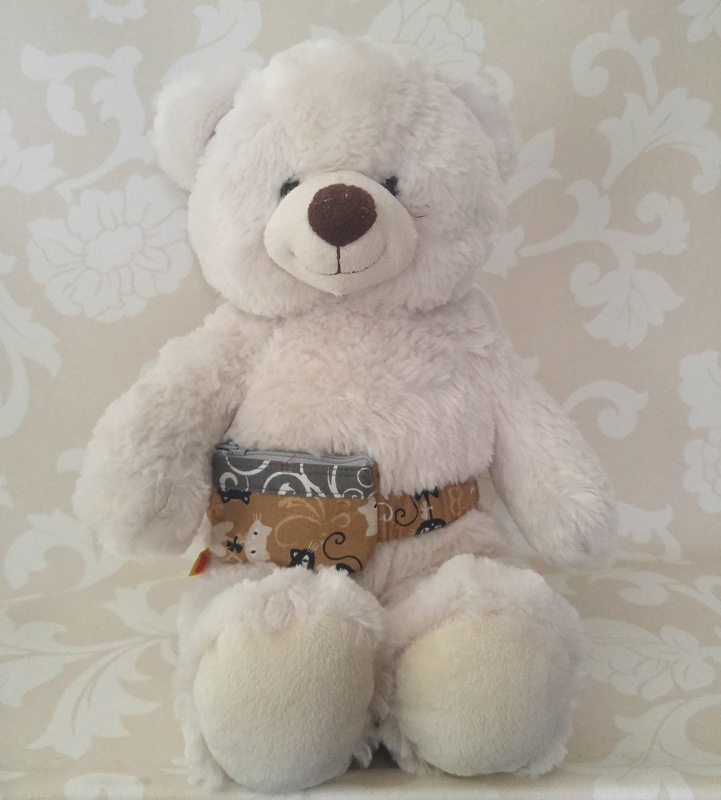 By the way, the pouches are not limited to use on 18-inch dolls -- they will fit on similar sized stuffies, such as our Build A Bear teddy bear. Diabetes nonprofit Carb DM is giving away a doll pouch (ARV: $18) from Too Sweet Boutique! To enter, leave a comment on Carb DM's Facebook post, or enter via the Rafflecopter widget below. Good luck! Disclosure: Thanks to Too Sweet Boutique for providing review/product giveaway samples and to Carb DM/Too Sweet Boutique for runing the giveaway. 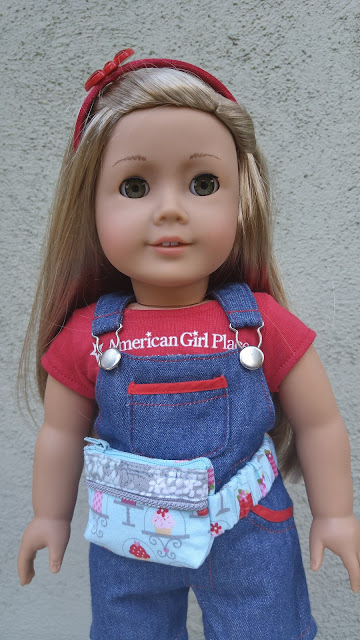 Carb DM is a client but this is not a sponsored post; I'm just sharing the giveaway because I love American Girl. The views and opinions expressed here are my own. In one month's time, Oakland Coliseum will be rumbling with excitement, because Monster Jam is coming to town! 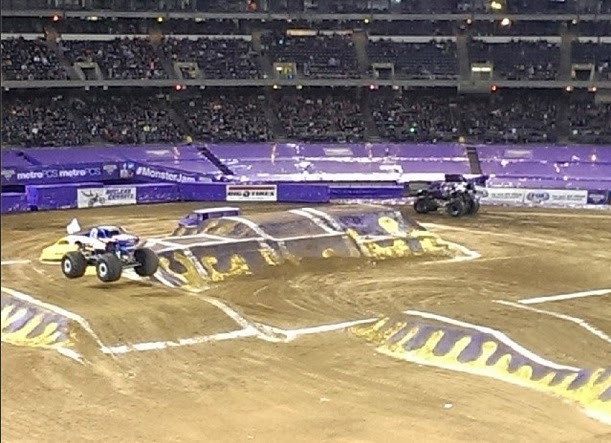 The 2015 Monster Jam show was amazing, and 2016 promises to be even better. Keep reading below for a show description, tips, videos, coloring sheets, and a ticket discount! Monster Jam is the world's largest and most famous monster truck tour featuring the biggest names in monster trucks including Grave Digger®, Maximum Destruction®, Monster Mutt®, El Toro Loco®, Captain's Curse® and Blue Thunder®. Monster Jam performs to the delight of families with three elements to every show -- the pit party, racing, and freestyle. 125 tour stops and 325+ performances make up the Monster Jam tour that also features a large consumer products division and retail presence. Two world champions are crowned each year at the Monster Jam World Finals in Las Vegas -- the racing world champion and the freestyle world champion. Want to find out more? Check out my post from last year, A Beginner's Guide To Monster Jam, with detailed descriptions of the monster trucks and what to expect. Here are a few tips to help you make the most of your day and enjoy the event to its fullest! Parking at the Oracle Arena/ O.Co Coliseum is $40. Cash and credit cards are accepted. The Pit Party is your chance to see these ginormous monster trucks up close, so don't miss it! The Pit Party opens about 2 hours before the main show begins. Pit Party Passes are $10 but you can stop by any participating MetroPCS location to pick up your complimentary pit pass. Free pit passes will be available while supplies last at participating Metro PCS locations from January 18-February 19. Here's something to get your kid excited for the upcoming Monster Jam: a coloring sheet featuring the awesome Max-D Monster Truck! There's still time to get your Monster Jam tickets -- don't forget, the show will only be in the Bay Area for one day! If you don't live in the Bay Area, check out the Monster Jam schedule to see when they'll be performing at an arena near you. Here's a great discount: Save $5 on adult tickets with code LOCAL. Kids tickets are always 50% off (no qualifier needed). Savings valid on regularly priced $30, $25, and $15 seats. Savings not valid day of show. No double discounts. Disclosure: I am a Feld Family Ambassador, and in exchange for my time and efforts in attending shows and reporting my opinion within this blog, as well as keeping you advised of the latest discount offers, Feld Entertainment has provided me with complimentary tickets to Feld shows and opportunities to attend private Feld pre-Show events. Show information (in italics) is provided by Feld Entertainment. The views and opinions expressed here are my own. Giveaway: Tickets to Monster Jam in Oakland on Feb 20! Attention, Bay Area families! Monster Jam is coming back for a death-defying, adrenaline-pumping, rip-roaring show! Last year it was held at Levi's Stadium in Santa Clara, and this year it's returning to its 2014 venue, Oakland's Oracle Arena. It's part stunt show, part racing competition, part freestyle competition, and all fun. I'm not into cars and trucks but I've watched Monster Jam for 2 years runningand loved it immensely. I felt lightheaded with all the gasping I did as each truck threatened to crash and burn, and I yelled myself hoarse as they completed their crazy stunts. It's hard to describe the spectacle of gigantic trucks with 60+ inch wheels, jumping over a hundred feet and flipping in the air, you just have to see it yourself! Monster Jam ® brings high-octane, motorsports entertainment to fans around the world. 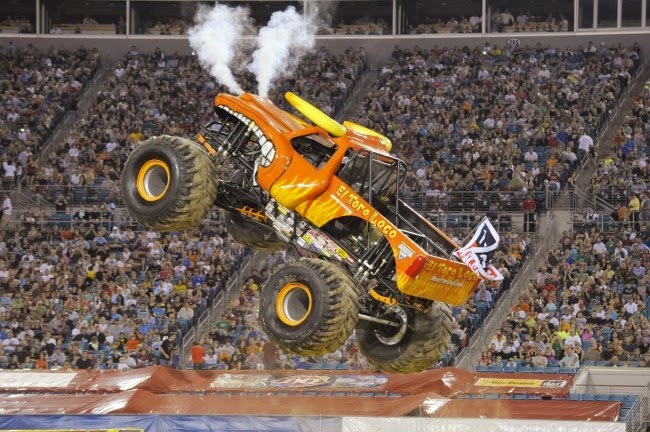 The action-packed live events feature the most recognizable trucks including Grave Digger ® , Max-D ® and many more, performing jaw-dropping displays of gravity-defying feats. Fans can also experience the non-stop racing excitement year-round on FS1. 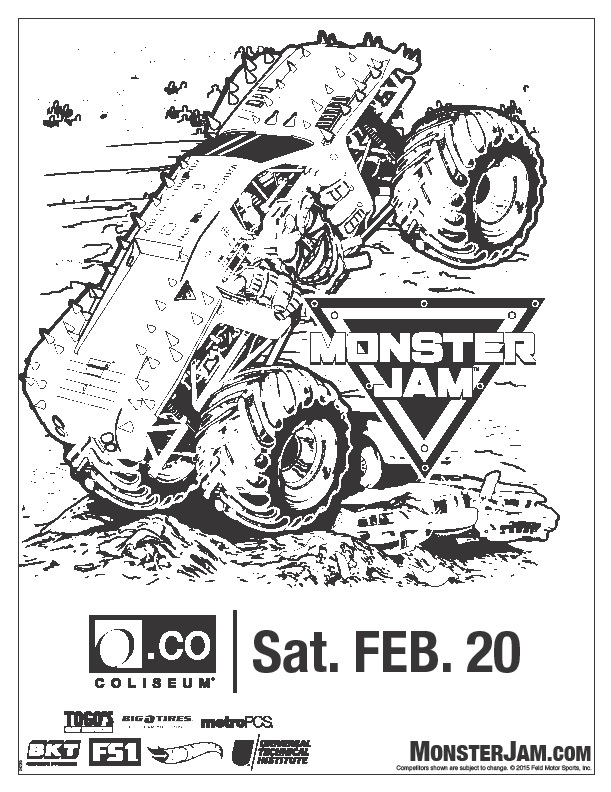 Get your Monster Jam tickets ASAP because the best seats are sure to sell out quickly! Don't forget, the show will only be in the Bay Area for one day! If you don't live in the Bay Area, check out the Monster Jam schedule to see when they'll be performing at an arena near you. Here's a great discount: Save $5 on adult tickets with code LOCAL. Kids tickets are always 50% off (no qualifier needed). Savings valid on regularly priced $30, $25, and $15 seats. Savings not valid day of show. No double discounts. 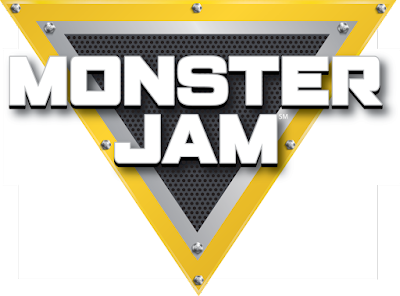 One lucky Bonggamom Finds reader will receive 4 tickets to Monster Jam at the Oracle Arena on Feb 20, 2016! To enter, just leave a comment on this post and tell me the name of your favorite Monster Jam monster truck. Giveaway ends 11:59 PST on January 24, 2016. Open only to residents of the SF Bay Area. Good luck! 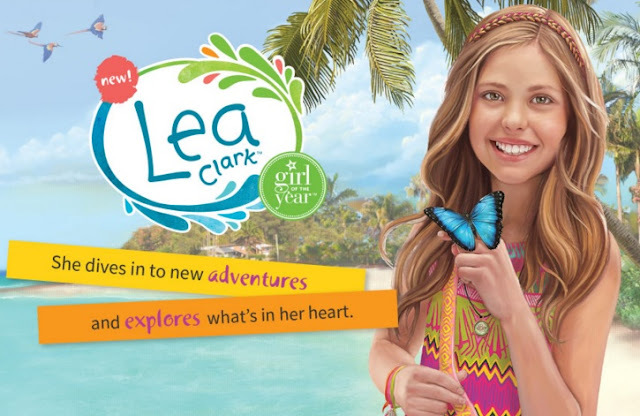 It's time to meet Lea Clark, American Girl's 2016 Girl of the Year! Lea is a photographer and an animal lover who likes to travel and explore. In Lea's 2-book series, girls can read about Lea's adventures when she goes to visit her older brother Zac in the Amazon rainforest. 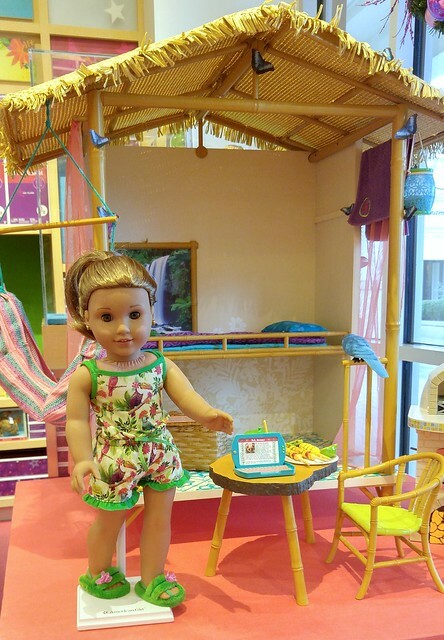 I went to the American Girl Store in Palo Alto to get a closer look at Lea and take some photos to share with you! Keep reading to find out more about Lea and her collection -- and enter for the chance to win a Lea doll of your own! I think Lea is one of the prettiest Girls of the Year. She has hazel eyes and long, wavy, light-brown hair. It could be the store lighting, but it looks to me like Lea's skin tone is slightly tanned, which would make sense given that she's in Brazil. I love the way her hair curls at the bottom! Lea's dress is so cute, and I can totally see her wearing it to any tropical place. 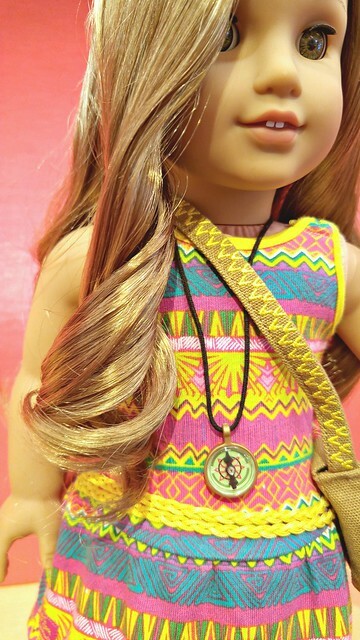 I was pleasantly surprised to find that Lea comes with a compass necklace and a messenger bag ( not part of her Accessory set, they both just come with the basic doll!). Lea's sandals are so adorable! Let's take a look at some of Lea's outfits and accessories, starting with the grandest of them all, Lea's Rainforest House! 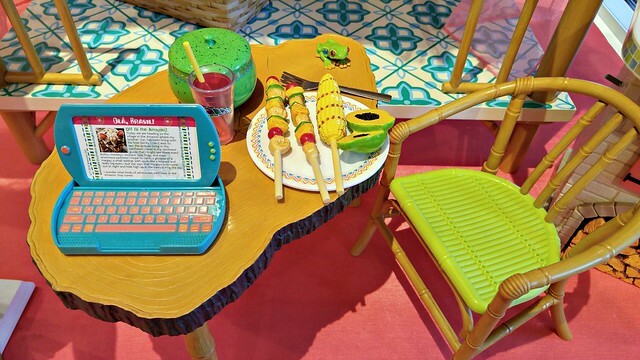 This gigantic playset comes with a ton of accessories -- and for $395, it had better! Her house has a thatched roof, lantern, hammock, and so much more. 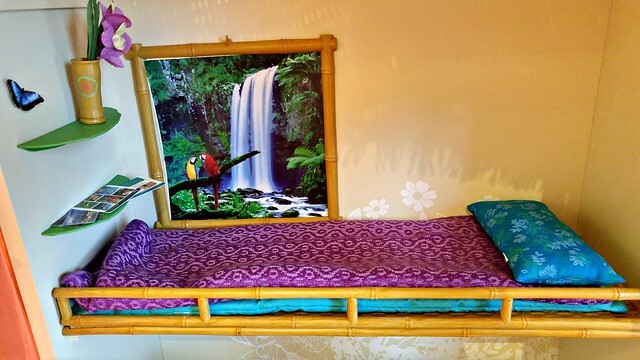 The loft bed has bamboo railings plus bedding in bright colors. Decorations include shelves, a flower vase, a framed poster, and post cards. 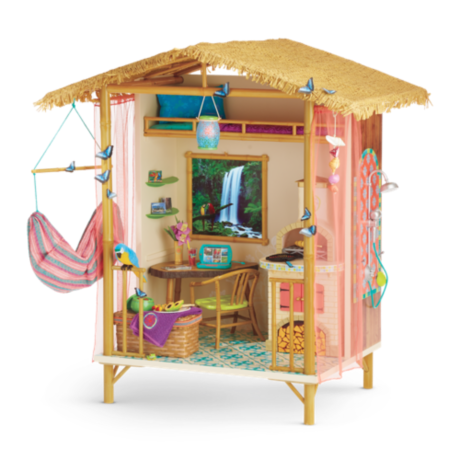 Lea is so close to nature, there are even tiny animals -- a blue butterfly, a parrot, and a tiny green frog -- and flit in and out of her house. I love, love, love this outdoor shower with mosaic tile backing! Also check out the soap-on-a-rope, seashell chimes and mosquito netting. Detail, detail, detail. The table and chair look like they are made with rattan, bamboo, and wood. There are a ton of native foods as well as utensils, a plate, a rice bowl, and a fruit drink. Lea can also use the table to work on her tablet and keyboard. A less extravagant, more practical playset is Lea's Fruit Stand, which is a relative "bargain" at $150. It includes lots and lots of pretend fruit, food, plates, utensils, a blender, baskets, counter tops, a working window, and more! (BTW check out Lea's Bahia outfit, $28 -- I would totally wear that printed top). Here's a closer look at the fruit stand. Like the Rainforest House, the outside of the Fruit Stand has great detail, so girls can play from all sides. 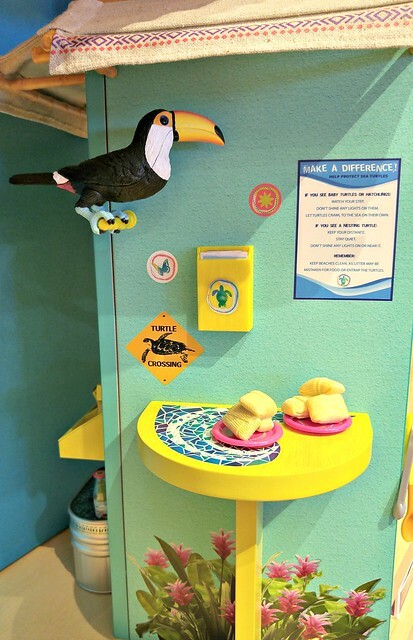 The side in the photo has a toucan perch, toucan, menu holder, and outdoor table. 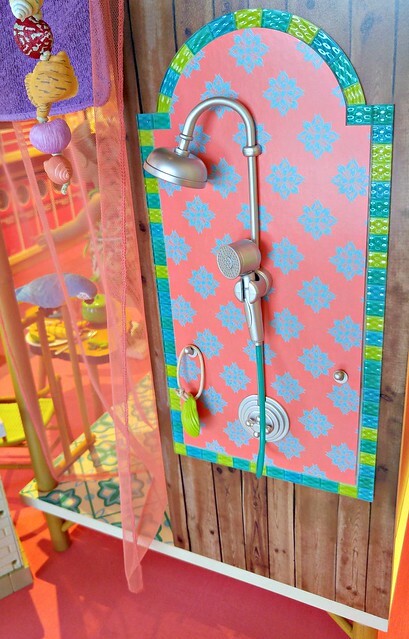 Girls can put decorative stickers on the side walls. Lea gets to explore the ocean in a clear-bottomed kayak with removable sail. The Ocean Kayak set ($85) includes a life vest but Lea's 2 piece swimsuit is sold separately (it's part of her Mix and Match Swim Set). The sea turtle is also a separate item. Here's the other half of Lea's Mix and Match Swim Set ($34). Everything else in the photo is part of her Beach Accessories set. Lea's collection comes with not one, not two, but three plush animals! 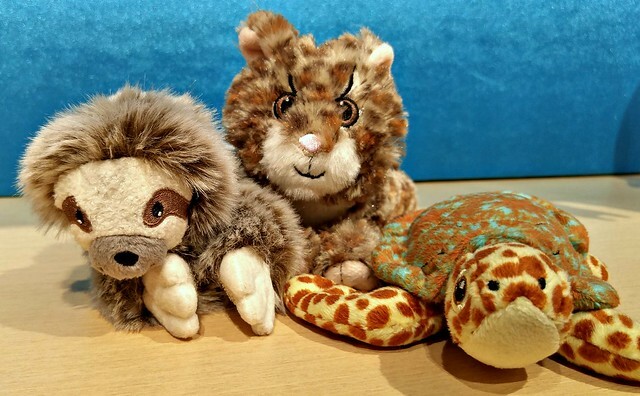 Because she's in the rainforest, the animals are also rainforest animals -- a Three Toed Sloth ($20), a Margay Cat ($20), and a Sea Turtle($18). And because no GOTY collection is complete without a worthy cause, American Girl will donate $1 to the World Wildlife Fund for each animal purchased, up to $100,000. Way to go, American Girl! Here's Lea with her new Brazilian friends. 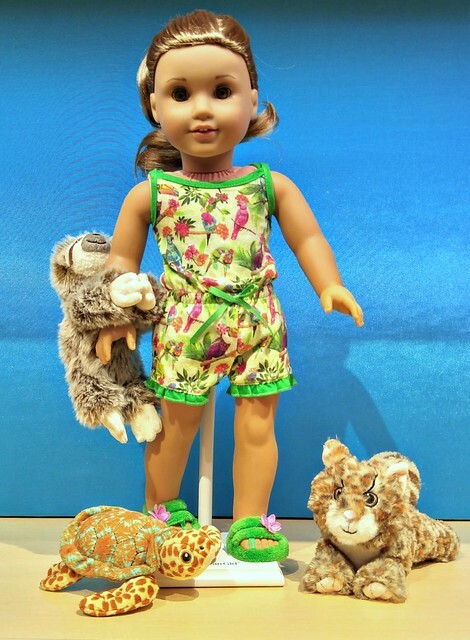 She's wearing her Rainforest Pajamas ($24). One lucky Bonggamom Finds reader will win a Lea doll and book! Enter via the Rafflecopter widget below by 1/26/2016. Good luck! 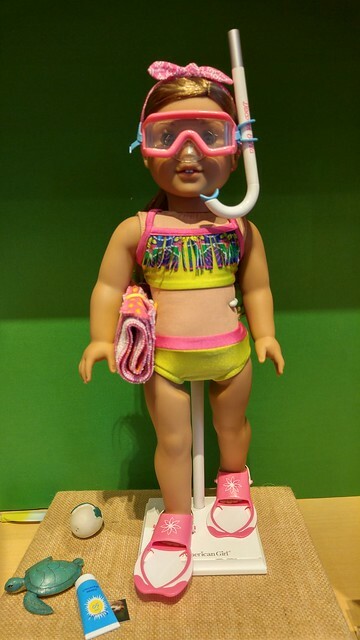 Disclosure: Giveaway doll provided by American Girl via Weber Shandwick. The views and opinions expressed here are my own. It's a new year, and we have a new American Girl doll! 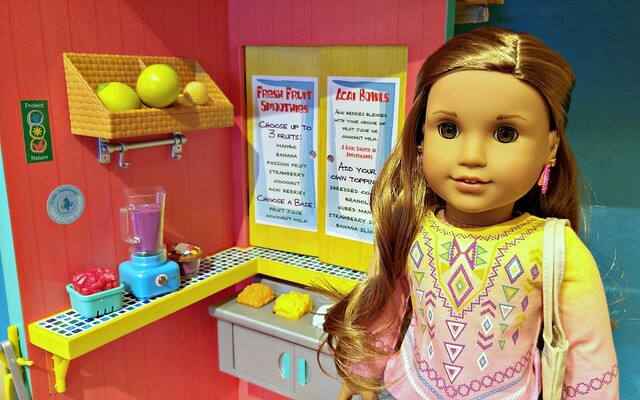 Actually, we have 2: the 2016 American Girl of the Year, which was introduced yesterday on Good Morning America, and a new historical Beforever doll, which will be introduced this summer. 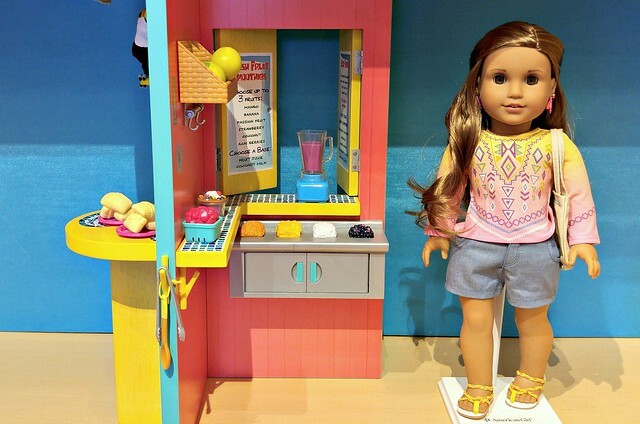 Lea Clark is American Girl's 2016 Girl of the Year. Lea is a photographer and animal lover who goes on the adventure of a lifetime when she travels to Brazil with her family. As always, American Girl has tied the release of the new GOTY to a worthy cause: saving wildlife. The company will be contributing $50,000 to the World Wildlife Fund, and donating $1 to WWF with every purchase of a plush animal in Lea's collection -- a rainforest cat, a sloth, or a sea turtle -- up to $100,000. In addition, girls are encouraged to host an art sale and donate the proceeds to WWF. Lea can be found online, via catalog or phone, and at the American Girl Store, as well as a host of accessories and playsets including a $395 rainforest house! Stay tuned for a closer look at Lea, and a Lea doll giveaway!! Even more exciting is the new American Girl Beforever girl, Melody Ellison! She is the first African American character doll released by American Girl since Cecile Rey in 2011. Year after year, The Pea and I have been hoping for an AGOTY of color. Obviously the AGOTY for 2016 is white, but having a new Beforever girl of color is just as good. 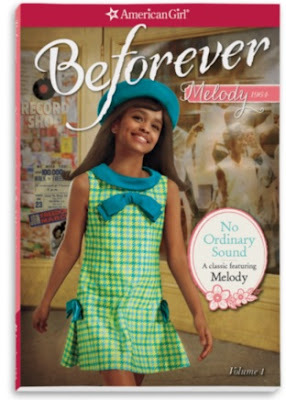 Melody is a girl who loves music and singing, living in Detroit during the Civil Rights Movement of the 60's. I'm so glad that American Girl is highlighting this portion of American History, especially with the recent Black Lives Matter movement. It's so important for young girls to understand how our past has shaped our present, and Melody's story will really help them get there. It has a been a long, 5-year wait, but when Melody comes out this summer, it will be worth it!